One theme that should be clear from our work on products like Messenger, Groups and Instagram is that our vision for Facebook is to create a set of products that help you share any kind of content you want with any audience you want. These are the words of Facebook’s CEO Mark Zuckerberg as he said on January, 2014. Note the phrase in blocks – “create a set of products”. Facebook’s new strategy is not to improve their core app over and over again. Instead they are trying to take over the mobile world by building (or acquiring) new apps which will serve different purposes. Their acquisition of Instagram and WhatsApp are two examples of this strategy. Now there is a third. Facebook has recently launched a new app for the iPhone called Paper. 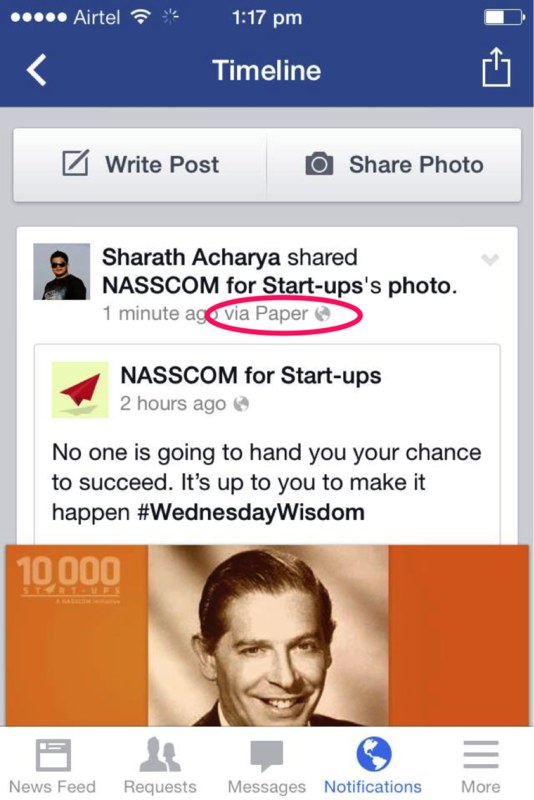 Paper was launched on 3rd February in the U.S. just a day before Facebook celebrated its tenth birthday. Paper is the first product of Facebook Creative Labs. 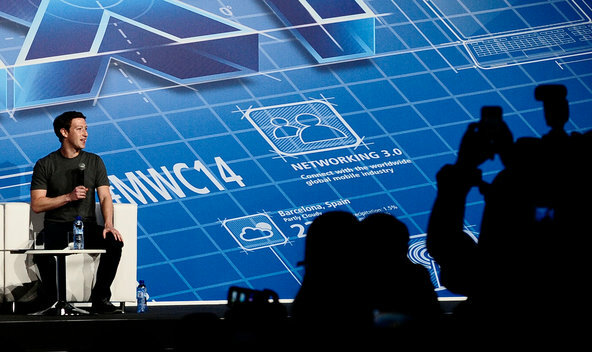 It was developed by a fifteen member team who worked on it for more than a year. The team has been successful in re-creating the Facebook’s News Feed into a highly immersive mobile newspaper. They didn’t alter the original Facebook app. They didn’t want to change things so drastically for their users. So now users who wish to continue with the original app can do so and users who want to switch to Paper to use Facebook can do so by installing this new app. Currently it is only available for the iPhone in the App Store. How is Paper different from the original Facebook app? Well in almost everything. This is an extremely carefully crafted mobile app which is designed to set new standards for the app industry. Let me show you some of its important features. In the old Facebook app, if you came across a high resolution image in your timeline, it appeared only across the dimensions of your device. So if the image were very large, it was crammed up into a small place. Not so with Paper. If you want to view a large image in Paper, click on it and the image will open up. It won’t fit your mobile’s screen but will go beyond that. Tilt your device left or right and you will see the sides of the image. The two screenshots below illustrate this point. In the image above, the mobile was held straight. The person then tilted the mobile to left and the image slid towards right to display the fourth person who was hidden when the mobile was held straight. Unlike the old Facebook app, Paper occupies the entire screen of the mobile device. This gives Paper a bigger and better look and the screen becomes visually appealing. For more features and in order to understand how Paper works I would recommend you watch this video. As I said above the Paper app was launched on 3rd Feb, 2014. The stats below from App Annie show how the rankings of this app have varied from its day of launch till 6th March, 2014 the time of writing of this article. The blue curve shows the ranking of Paper for the overall US category and the red curve shows the ranking for the US social networking category. On the day of the launch Paper was no. 1 in the US social networking group and no. 2 in the US overall category. After a few days this top notch position has declined. On 5th March, Facebook implemented a new hack to grow this app. Now the new options to share articles by email, Facebook message or text message will automatically include a phrase – “Via Paper” linked to paper on appstore. Of course this will help them spread the word, and will urge more people to install and use this app. This is somewhat akin to the growth hack employed by Hotmail in the 1990’s when emails sent through their service contained a message at the end containing a link to Hotmail which led to massive growth for the company. 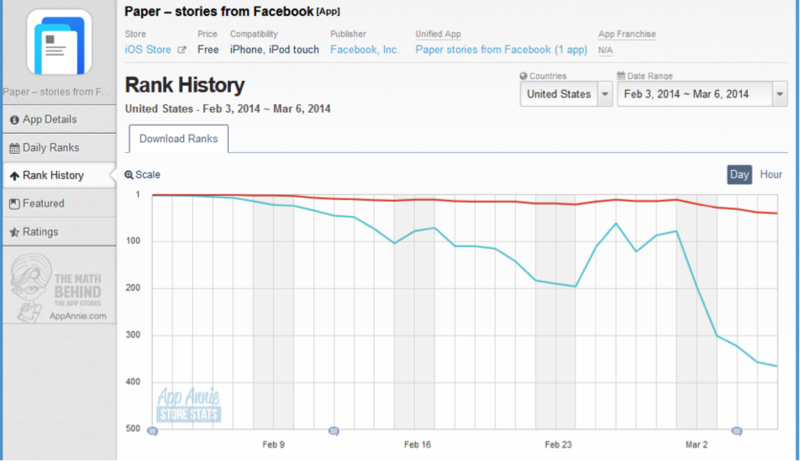 It is too early to tell how this growth hack will help Facebook grow its Paper app. Some people are suggesting that Paper will replace the original Facebook app as Paper also contains the core Facebook functions like sending and receiving messages, liking and sharing a story in your News Feed, etc. We can just wait and watch. Have you tried Paper? If yes what was your experience with it? Let me know in the comments below. Push Notification -The Growth Hack That Your App Needs!